I had to go Savannah for a work conference and was looking for something different to eat. I wanted to go downtown because I figured that was the best area for a lot of different options. At the time it was raining, so walking around was out of the question. I searched on my phone for area restaurants and that is how I found Jazz’d Tapas Bar. 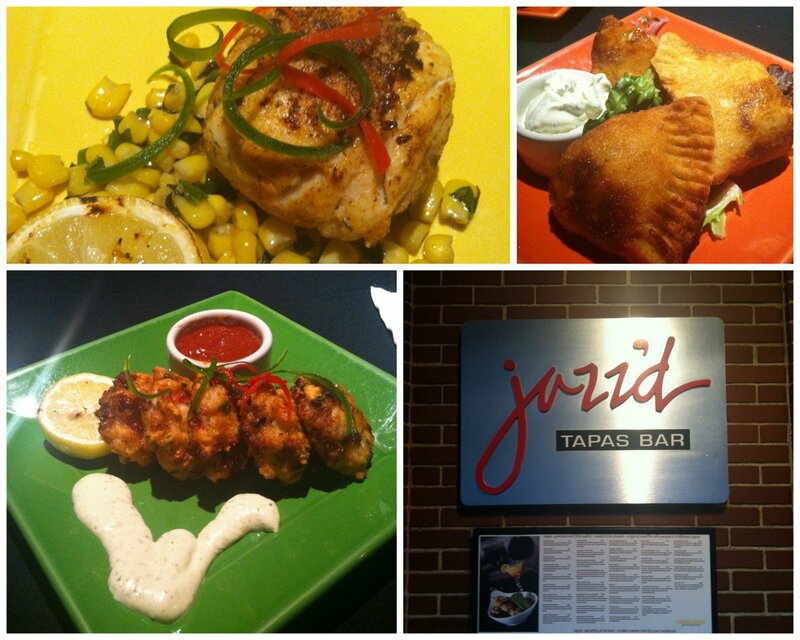 Jazz’d Tapas Bar is in Savannah’s Historic District on Barnard St. The bar is below street level lending to the cool, jazzy vibe. Not the best choice since it was raining cats and dogs because there were giant puddles near their entrance. But once inside, the atmosphere put me in the mood to order food and a tasty drink. This was the ultimate jazz bar with jazz/blues music playing in the background. The thing about tapas menus is that you are usually hungry and want to try everything. Most menu items were between $7 – 10 each. I splurged and ordered 3: pork empanadas with a tangy sour cream dip, crab cakes with a herbed remolade, and roasted chicken over corn relish. I could not eat all that I ordered, so I took what was left of my empanadas for a late night snack. Since I was living in the moment, I felt that I had to order a martini. It seemed like the sophisticated thing to do. I forgot to take of picture of it, but it was a delight for me taste buds as well. Everything was really delicious. My favorite was the empanadas. The pork filling was flavored with BBQ spices. It was a fusion of Southern BBQ and Latin cooking style. I read that Jazz’d has received awards for their food and swanky digs from Cosmopolitan Magazine, Southern Living, and Savannah Magazine. I have to agree the food and ambiance were on point. If you are ever in Savannah and want to visit an upscale restaurant for food and drinks, keep this Jazz’d Tapas Bar in mind. They change the menu every so often, so you might not be able to order the empanadas, but whatever you order, I can imagine that it will be delicious.